The Leaders Of The EU Have Gone, With Italy’s PM, Down Memory Lane or as Richard North points out Angela Merkel for Germany & Francoise Hollande for France have gone with Matteo Renzi PM of Italy on a nostalgia trip to Ventotene, to evoke the memory of Altiero Spinelli, & concoct a way forward to try to rebuild the EU! Whenever the “colleagues” are in trouble, it seems, they return to their roots. 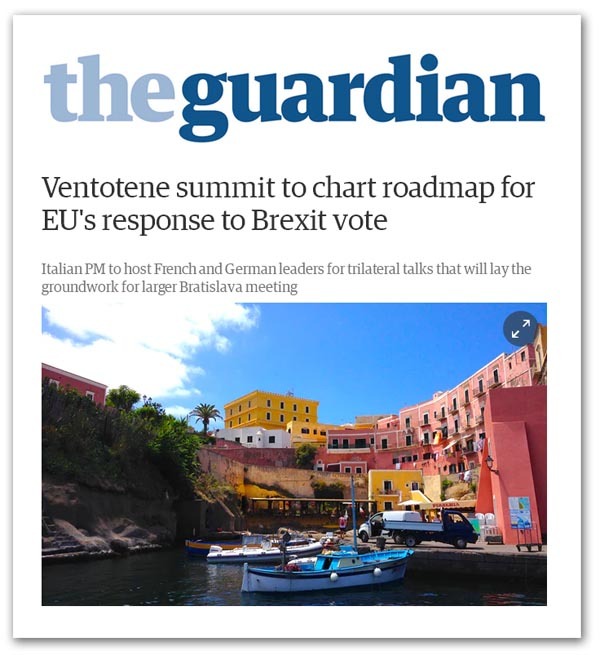 They’ve been back to Verdun several times, they went to Messina in 1995 and now they’ve just been to Ventotene, the small island off Naples, home to Alterio Spinelli in 1941 when he wrote the Ventotene Manifesto CLICK HERE for a “free and united Europe”. But this was hubris rather than a learning experience. In a response to the UK’s referendum, Italian Prime Minister Matteo Renzi told reporters: “Many thought the EU was finished after Brexit but that is not the case”. He was welcoming François Hollande and Angela Merkel aboard the Guiseppe Garibaldi light aircraft carrier, and went on to say: “We respect the choice made by the citizens of Britain but we want to write a future chapter. Europe after Brexit will relaunch the powerful ideals of unity and peace, freedom and dreams”. This brave new world, however, is nothing more than a rehash of tired old themes, with the “colleagues” pledging to bolster EU security, boost economic growth and give the continent’s youth a future. This, they believe, amounts to a “revival”. Just for once, the Mail CLICK HERE seems to have got it right. “Instead of such lofty idealism”, it reported, leaders of Germany, France and Italy faced the grim reality of a growing backlash to their handling of the migration crisis and terrorism – and disagreements over how to proceed. Merkel recalled that European integration was the consequence of dark times in European history, but then seemed to confine herself to calling for more information sharing between European intelligence agencies. Inspirational, this was not. What was clearly lacking – from the public pronouncements at least – was any sense of a greater vision, a rallying cry to pull together a damaged Union and bring it together, or give it a new direction. This reflects a failure to agree on the fundamentals, and bodes poorly for the future. Following the referendum, it has been very obvious that the UK government is not offering any great vision for a post-Brexit Britain. But the Europeans, it seems, have similar problems, failing to recognise that Brexit is as much a problem for the EU as it is the UK. Immediately after the referendum, Merkel did seem to recognise the gravity of the situation, saying: “There is no point beating around the bush. This is a blow to Europe, a blow to the European process of integration”. The EU is in the process of losing a major member, with no candidate country of equivalent status that can replace it. In many respects, Brexit represents the high water mark of European political integration – the end of the dream of a United States of Europe, “a dream that has not been able to force its way into the real world”. There are some who would argue that it was the colleagues’ lack of vision that pushed the UK out of the EU – on the basis that if they had been more imaginative in supporting Mr Cameron’s “renegotiations”, history might have been different. But now the UK is in the throes of leaving the EU, the remaining Member States need to realise that Brexit is their problem as well as ours. Hollande speaks of the EU facing “fragmentation and division”, needed a “new momentum”, but he also is unable to offer anything inspirational. Ironically, it would seem, the UK and “Europe” have never been more united, albeit in their inability to offer a coherent response to one of the most important political events of the Century so far. Where there is a difference, it is in the UK Government going AWOL, while the colleagues do what the always do and retreat into nostalgia. Previous Previous post: Hear No Evil, See No Evil, Speak No Evil as The EU Leaders Refuse To Learn! Next Next post: Nigel Farage Drags BreXit Into The Muddy History Of Mississippi Racism!